Find the wireless device and phone/data plan that works for you! Blackberry Tour, Blackberry 8900, and Palm Pre. as the university's tenth president. this search was in every way inclusive, fair and transparent. the university's president since 2007. The plaintiff's attorney does not agree and will fight on. or if there are other deaf Canadian physicians before her. where members used signs to communicate with each other! them a lot on voice telephone every day. He graduated from college and applied for a job. job could be offered him. Coda that he has a serious hearing loss. to each other, and she panicked. people to report to her. 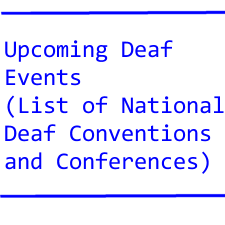 Cheryl L. Dickson, not deaf, is everywhere. Academy for Listening and Spoken Language. to send a text message. That was in 1995.
of radio hams in Ohio in the early eighties. forthcoming. She would turn on the device. Many people complain that cars are too noisy. of convertibles making drivers deaf! But there is a twist to these hybrid cars. create noise...but that there is a lack of noise. Not a problem with us, the deaf drivers. deaf with interpreters, CART services and note takers. it; He said never mind and to keep the change! is to say he's not entirely blind? movies are simply out of luck. at Rhode Island School for the Deaf. $500,000 donated by Rush Limbaugh to House Ear Institute. requirements of the work area. 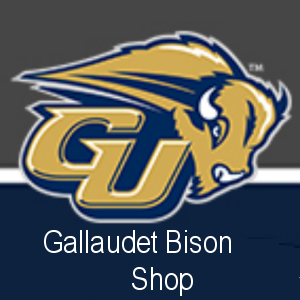 opportunities for Gallaudet University to have an impact in the region. rehabilitation or related field, Fluency in sign language required. and effectively across great distances through a variety of media. with work schedule. Willing to travel extensively throughout the region. join us and lead as Superintendent/Chief Executive Officer (CEO). advocacy, vocational and social service agency. largest school for the Deaf in the state of New York. adults throughout the metropolitan area. program for children in the local community. fundraising arm of Lexington Center. financial management, development and evaluation of all programs. reports and a total staff of approximately 350.
and social services programs for individuals with hearing disabilities. 4. Fluent in American Sign Language.